08.10.2005 PEARL OF THE DAY №5: PEARL BARLEY, SIR! When the person beats one and all and gets a one and a half point lead without waiting till the end of the tournament, one against one's begins to scrutinize him closely and consider how he will look with laurel wreath. I mean not how it suits his costume and figure, but in more metaphysical meaning. As far as I understand, it is ascertained that concerning astrological aspect Topalov has no contra-indication to champion's title. One more aspect comes to my mind. Painful process that has begun more than three years ago in Prague and limped to Argentina in some distorted form is called unification. Maybe irresistible thirst on the linguistic level exists to make all world champions the citizens of one country? We want simplicity in the relationships with world around so much, we are so tired to give complicated answers to an elementary question, «Who is the champion?» and invent intricate versions... And if Veselin wins this tournament, one will be able to report neatly and briefly: «The world best chess players in men and women categories are Bulgarians by origin» – and go on to the next agenda item, concerning sponsorship request. Of course, in the Svidler-Topalov game we could agree with any result except for the one fixed in reality. But I seem to be not the only one who thinks that all our preferences fade into the background in the face of such a play by Veselin. If he holds his current pace, then only inveterate patriots will not take their heads to him. And as I have already used a sport word «pace», I would like to say a few words about coming doping-control. An official announcement says that in the end of the tournament some lady with tubes will come and make tests carefully. I am biased for sure, but from my point of view this is another absolute nonsense, so typical for FIDE. Is it possible that it is again willing to enter the Olympic family? So, two weeks after the championship chemical laboratory report will come with following text, «The guy that got 12 points of possible 14 in your tournament cannot be considered the champion. We found a medication in his blood that caused disqualification of 20 long-distance runners during the last 5 years. And the one who got the second place with 8 points is OK, so he will be the champion». If Kirsan and his team will not take this information into account, than what was it all for? And if they consider this information, and will behave like athletics heads, then they will make themselves laughing-stocks again – do you know how many people will consider themselves the champions? The first prize winner, the second one, and many of those who did not take part in the Argentina tournament... Because nobody will take the competition results seriously. I do not know on which height above sea level San Luis is situated, but someone told me that people in the high-level regions of Latin America snuff cocaine – not to get special sensations, but to clean the brains simply, otherwise they act slowly. It does not matter for me at all what Veselin Topalov eats and drinks, the photo where the security makes sure that Bulgarian grandmaster does not have laptop in his bosom is more than enough for me. But of course my opinion is not taken into account; I am not the FIDE official. My moral qualities are unsuitable. Okay, the whole second paragraph contains only hypotheses and theorization. The tournament equator is not crossed still. Topalov has two crucial duels with his offenders of both sexes. 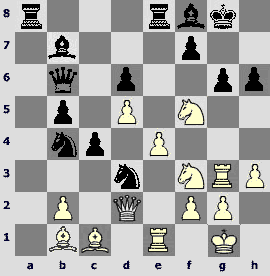 Kasimdzhanov stopped him in Tripoli (where Veselin made the same strong impression as in San Luis); Polgar deprived him of the first prize in Wijk aan Zee. I cannot know whether this secret urge to gain revenge can influence the leader's actions, but in any case in the sixth round he has to take care, because woman can «...break your dreams with only harsh smile», as a funny band «Toadstool» declaimed. In her own way Judit is not worse iron lady than Margaret Thatcher. She can easily stand up against the reunion of Antoaneta and Veselin. This night we will see whether I foresaw it or took the wrong sow by the ear. It seems to be high time to go on to the topic of the column. What is on the menu today? Pearl barley again? We have to choose from one candidate. Relatively quiet Tripoli finalists' game has no claims. Morozevich strenuously drew fire upon himself in the game with Polgar and naturally got shady position, but managed to neutralize opponent's pawn centre with the help of the side queen and bishop maneuvers so typical for him. It is not a pearl, though the game was interesting. Anand was close to creating positional canvas, but acted too straightforward in the opponent's time trouble and White's advantage vanished. There is only one decisive game left. I will not give chess assessments because Sergey Shipov on Chess Pro has thoroughly analyzed the leaders duel both live and postmortem (in the net discussions there was something gloomy and blood-thirsty in the sketches concerning world championship, and I will also contribute my share). The result of the game was decided by one Svidler's mistake in time trouble, beforehand there was very consistent struggle with mutual chances. But the true reason is not in that. Both Alexander Khalifman and Alexander Grischuk noted that Petya still has bad openings, and begged him: «Just do not get worse!». And still he did not manage to leave the opening without losses. Sometimes when you ask Petya about some of his games and hear honest and self-critical «As you can guess, this and that was blundered». Judging by the time spent and TWIC photos, here the same thing happened. No serious attention was paid to the f3 check by the knight, and this led to the loss of the precious time. Topalov undeviatingly rejected a draw and was profoundly rewarded for that. There will be the chess part in this article. Conversations in guest books encouraged me to investigate further the position that arose in the Anand-Adams game after atomic novelty 23.Јd2. I should say right now that I did not make any sensational discovery, but I revealed many interesting variations, that I am going to share with you. Maybe someone will be lucky to find any more resources. Here are exemplary variations: 31.Ґe3 Јa5 32.ўh2. If Black plays greedy 32...Јxe1, then after 33.Јg7+ Ґf7 34.Ґe4 White is in a better situation, in spite of temporary rook and exchange absence. 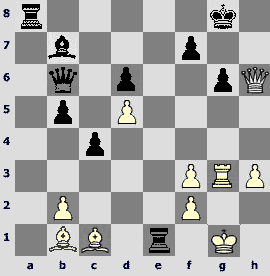 But if the opponent jettisons the ballast – 32...¦xb1 33.Јxb1 ўd7 34.Јf5+ Ґe6 (34...ўc6?! 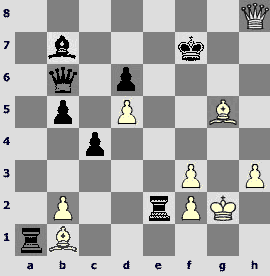 35.¤c2) 35.Јe4 Јa8 36.Јd4 ¦g8 37.¤f3 – then White has to play with fear. An alternative is 31.Ґg5+ ўd7 32.Ґf5+ ¦e6 (32...Ґe6?? 33.Јf7+) 33.Ґd2 (33.Ґxe6+ Ґxe6 34.Јg7+ ўc6 35.Ґd2 Јc5) 33...Јd4 34.Ґc3 Јh4 35.Ґg4 or 34...Јf4 35.Јh5. 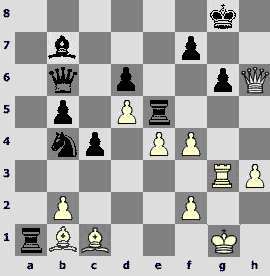 One cannot say that White loses, but it does not look as a play for a win. Mikhail Golubev supposes not without reason that other White's chances on 24th move look crazy. But WCA influences the soberness of mind in a certain way, and I decided to go mad. And not only I. However, IM Malcolm Pein did not lose the head in this madness, and although he gave only one line on 24.¤xh6+, this one leads straightly to a draw – 24...Ґxh6 25.Јxh6 ¤xf3+ (I will also note that 25...¤xd5 26.¤g5 ¤f6 27.¦g4 is very doubtful for Black) 26.gxf3. 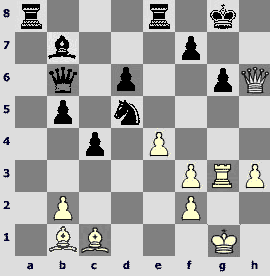 26...Јd4 27.e5 ¤d3 28.¦xg6+ fxg6 29.Јxg6+ ўh8 (29...ўf8? 30.Ґh6+ ўe7 31.Јxd6+ ўf7 32.Јf6+ ўg8 33.Јg7#) 30.Јf6+ with inevitable perpetual check. As a matter of fact, 27...Јxe5 28.Ґxg6 Јxg3+ 29.fxg3 fxg6 30.Јxg6+ ўh8= is not bad for Black as well, and White hardly can afford himself 31.Јh6+ ўg8 32.g4 ¤xd5 33.Јg6+ ўh8 34.Ґh6 ¦e7. And 27...Јd1+ leads to a defeat after 28.ўh2 ¤d3 (28...Јxc1 29.Јxc1 ¦xe5 30.Ґxg6) 29.¦xg6+ fxg6 30.Јxg6+ ўh8 31.Јf6+ ўg8 (31...ўh7 32.Јf7+ ўh8 33.Ґg5) 32.Ґh6. Maybe I like Malcolm would not wander in these labyrinths, but what is peculiar about this position is that the Fritz considers it absolutely won by Black in many variations. At least in the beginning White's position is assessed as awful. It happened so that 26...Јd4 was not the first move I found, so I considered a couple of «winning» moves before that. 28.f5! ¦xf5 (28...¦xb1 29.fxg6 ¦xc1+ 30.ўg2!!) 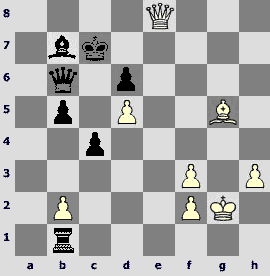 29.exf5 ¦xb1 30.fxg6 ¦xc1+ 31.Јxc1 ¤d3 32.gxf7+ ўxf7 33.¦f3+ ўg6 34.Јf1, and White's major pieces reach the king. 26...¤xd5 gives a variety of possibilities. 1) 27.e5?! dxe5 28.Ґxg6 fxg6 29.¦xg6+ Јxg6+ 30.Јxg6+ ўf8!? 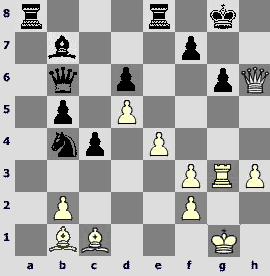 (30...ўh8=) 31.Ґh6+ ўe7 32.Јh7+ ўd6 33.Јxb7 b4, and Black plays for the victory. 2)27.¦g4?! Јd4 (27...¦a1 28.exd5 ¦e2 29.¦xg6+ fxg6 30.Јxg6+ ўf8 31.Ґh6+ ўe7 32.Ґg5+ ўd7 33.Јf7+ ўc8 34.Јf8+ ўd7 35.Јf7+=) 28.e5 Јxg4+ 29.hxg4 ¦a1 30.Ґxg6 fxg6 31.Јxg6+ ўf8 and draw is the maximum for White. 28.ўh2! White wins with self-suggesting 28...Јxf2+ 29.¦g2 Јf1 30.Ґxg6 Јh1+ 31.ўg3 fxg6 32.Јxg6+ ўf8 (32...ўh8 33.Јh6+ ўg8 34.ўf2+ Јxg2+ 35.ўxg2ќ) 33.Ґh6+ ўe7 34.Јg7+ ўe8 (34...ўd8 35.Јxb7) 35.Јxb7 ¦aa1 36.Јxb5+, but in case of cautious 28...¦e2! 29.¦g2! (29.¦xg6+? fxg6 30.Јxg6+ ўf8 31.Јh6+ ўe8 32.Ґg6+ ўd8°) 29...¦xf2 there is a draw – 30.Ґxg6 ¦xg2+ 31.ўxg2 fxg6 32.Јxg6+ ўh8 (32...ўf8=) 33.Ґg5 ¦f8 34.Ґe7 Јe3 35.Ґxf8 Јd2+ 36.ўg3 Јe1+ 37.ўg2 Јd2+. 30.Ґe3?! ¦xg2+ 31.ўxg2 Јc7 32.Ґd4 f6 33.Ґxg6 is risky (33.Ґxf6 Јh7 34.Јg5 Јh5 35.Јg3 Ґxd5, and if 36.Ґxg6, then 36...Јxf3+ 37.Јxf3 Ґxf3+ 38.ўxf3 ¦f8 is even worse) 33...Јg7 34.Јh5 Ґc8, and the attack reaches a deadlock. 4) Finally, a grand prophylactic move 27.ўg2!? Probably, both Kasparov and Dvoretsky would indulgingly tap me on the shoulder (caress my cheek, knock my head – strike out the wrong variants). The defense of the g6-square provides White with strong attack in other directions – 27...¤e7? 28.Ґe3 Јc7 29.Ґd4 f6 30.e5 ўf7 31.Ґxg6+ ўe6 32.Ґf7+ ўd7 33.Ґxe8+ ¦xe8 34.exf6 or 30.Ґxf6 ўf7 31.e5 ўe6 32.Ґxe7 ўxe7 33.Ґxg6. One more combat unit destruction by 28...¦xb1 leaves almost no resources to White, but strangely there is still a glimmer of attack – 29.¦xg6+ fxg6 30.Јxg6+ ўf8 (30...ўh8? 31.Јxe8+ ўg7 32.Ґe3) 31.Ґh6+ ўe7. Now 32.Ґg5+ ўf8 33.Јf6+ ўg8 34.Ґh6 leads to a perpetual check. Black still can imitate the play for the victory, taking the e8-rook away from the attack with the help of the clever maneuver – 34...¦g1+!? 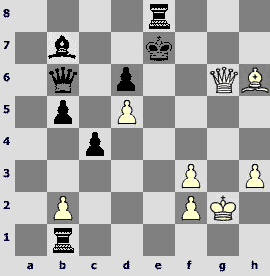 35.ўxg1 ¦e1+ 36.ўg2 Јc7 37.Јg6+ ўh8, but White has 38.Ґg5! ¦e7 39.Јh6+ ўg8 40.Јg6+ ¦g7 41.Јe8+ ўh7 42.Јh5+. 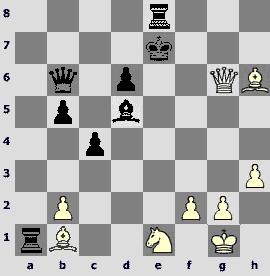 A very curious position arises after 32.Јe6+ ўd8 33.Ґg5+ ўc7 34.Јxe8. Only 34...Ґc6! can save Black. White cannot play 35.Ґd8+? ўc8 36.Јe6+ ўxd8 37.Јxd6+ ўc8 38.dxc6 Јd8, the only choice left is the queen retreat with more or less even play – 35.Јg8 Јc5 or 35...Ґxd5 36.Јh7+ ўc6 37.Јxb1 Јd4. And finally, did Anand close the variation, or he just submitted an interesting idea to centaur analysts to tear it to pieces, having earned an important point? Who knows, dear Watson, who knows?